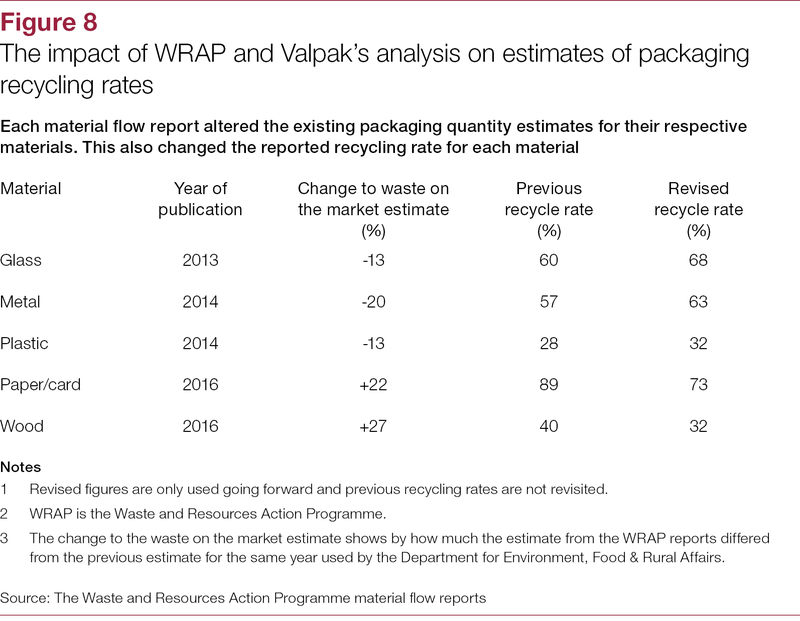 Reducing waste and using resources more efficiently are long-standing policy objectives for government. 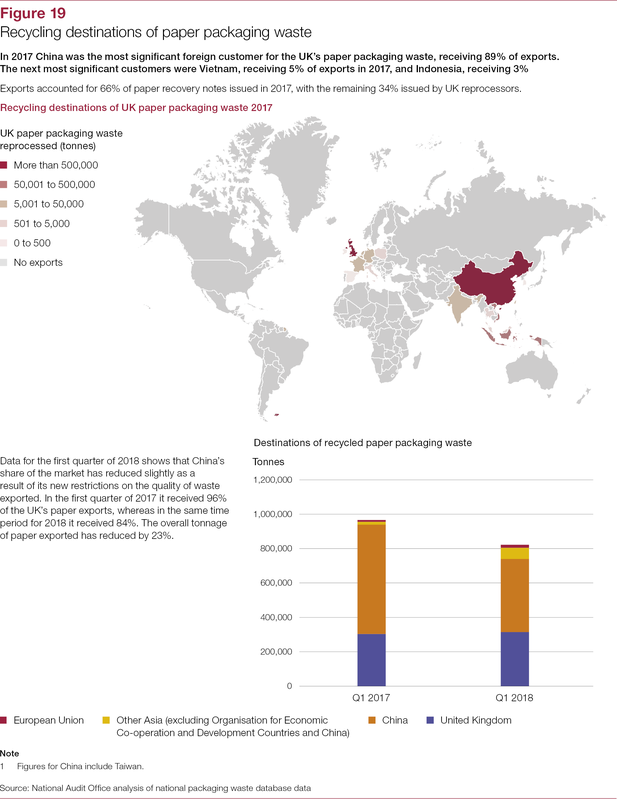 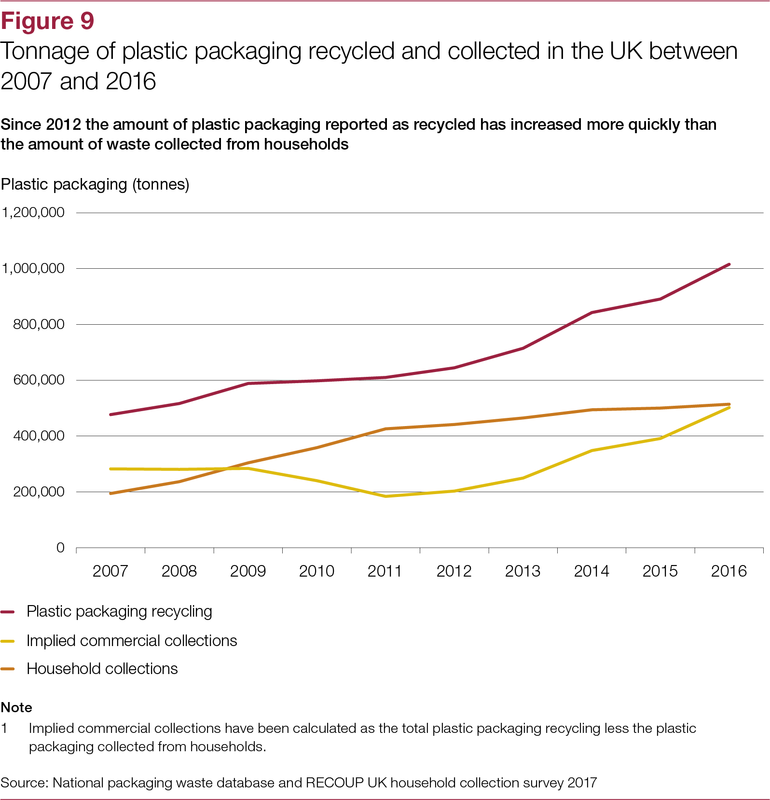 Tackling packaging waste is essential to achieving these ambitions: government estimates that UK households and businesses use around 11 million tonnes of packaging each year, which would imply packaging constitutes around 17% of total household and commercial waste. 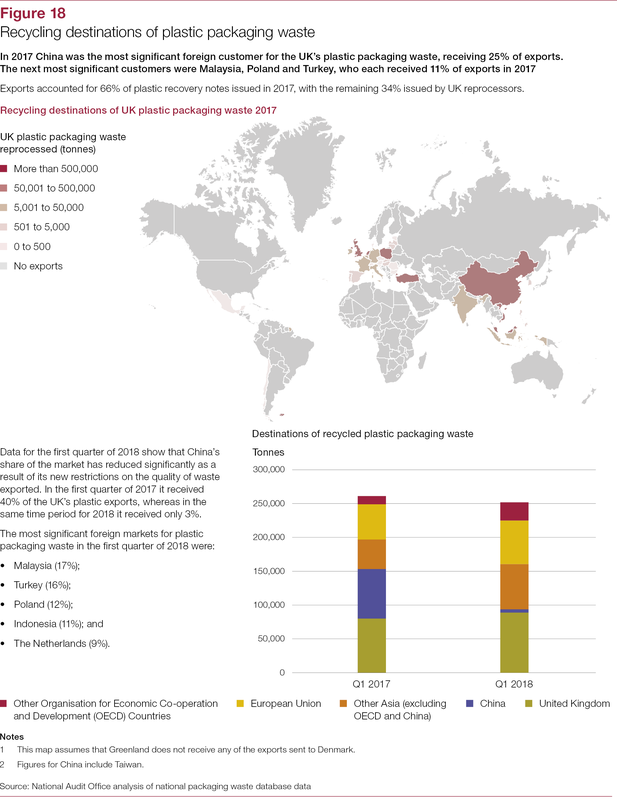 There is also growing public and scientific concern about the environmental and health impacts of pollution from plastic packaging, particularly because of plastic litter in the oceans. 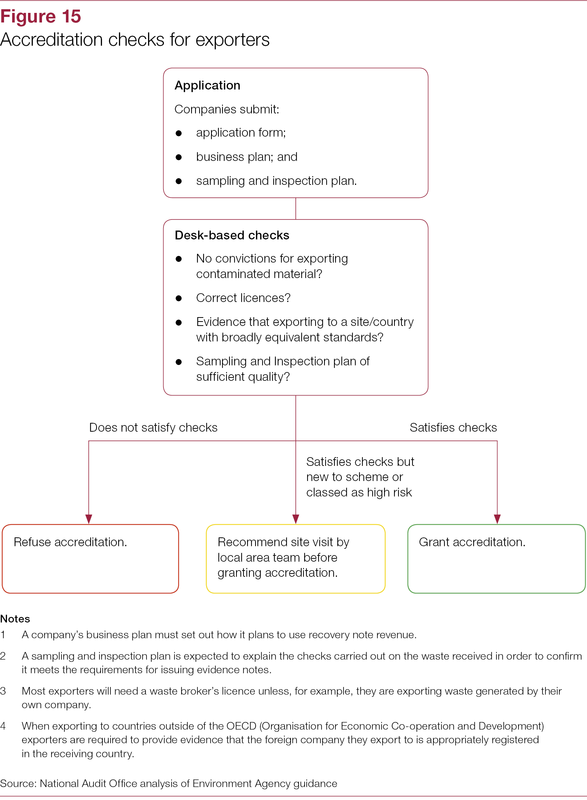 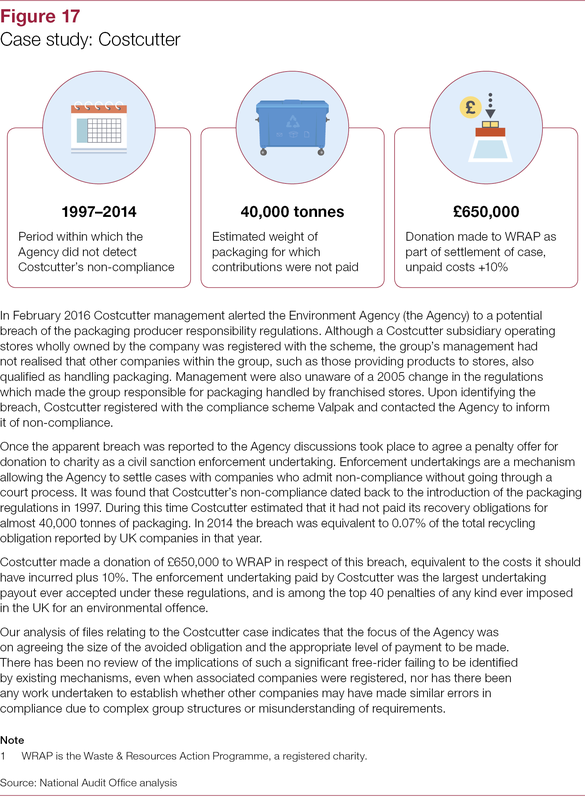 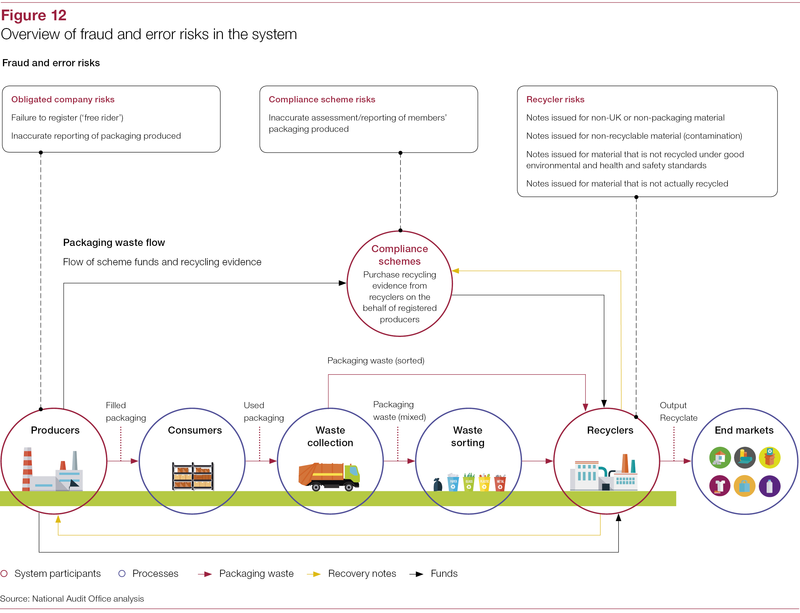 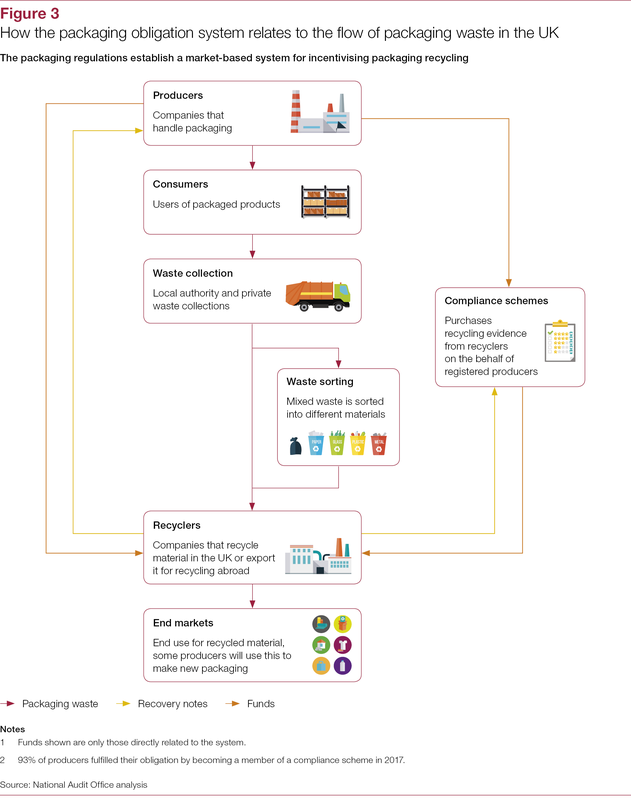 This report examines the packaging recycling obligations, in response to a request from the Environmental Audit Committee. 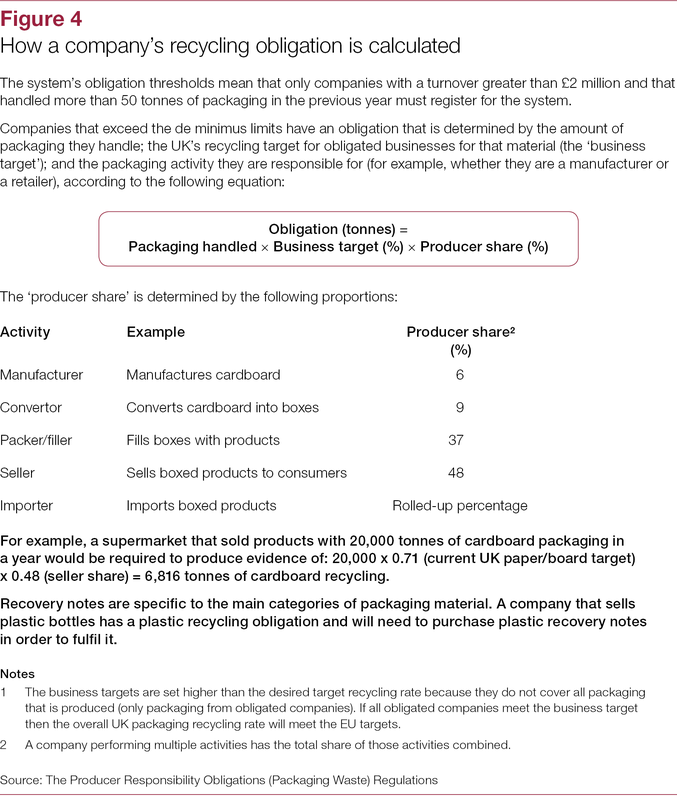 The government introduced these obligations in 1997, when it chose to establish a market-based system for incentivising recycling of packaging waste as part of implementing an EU Directive on packaging and packaging waste. 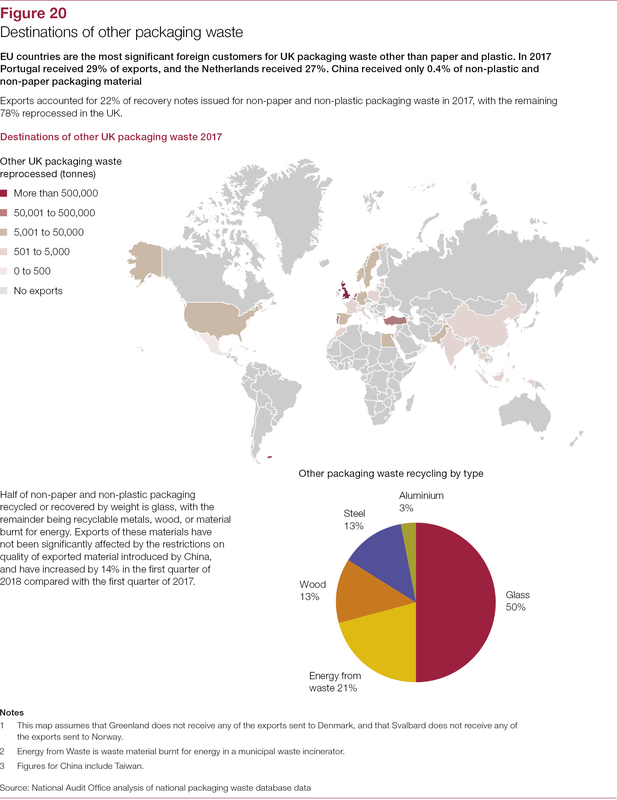 The packaging regulations require companies that handle packaging (and that meet certain thresholds) to demonstrate that a certain amount of packaging has been recycled. 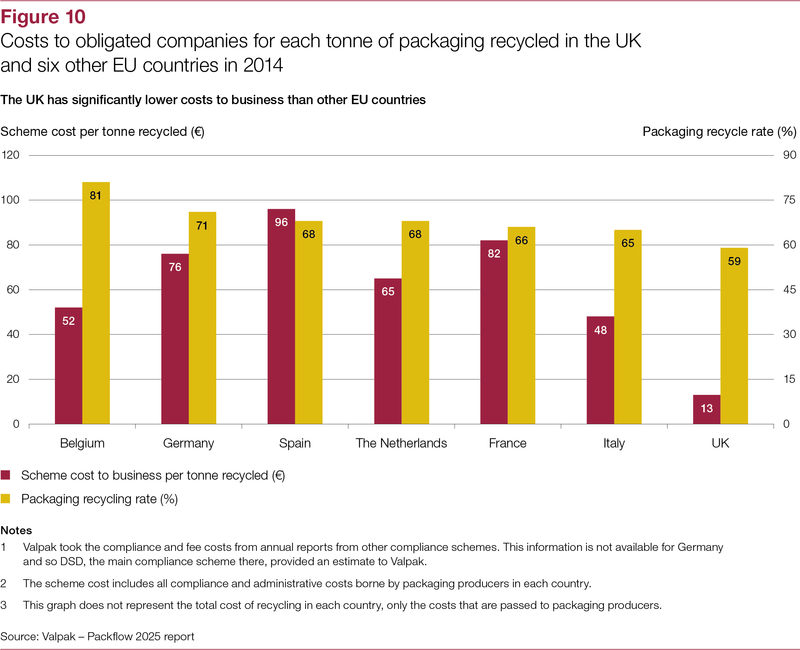 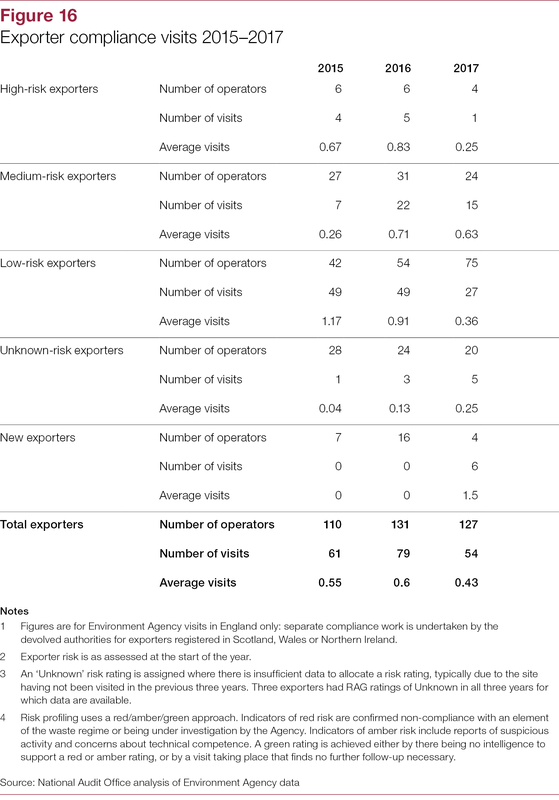 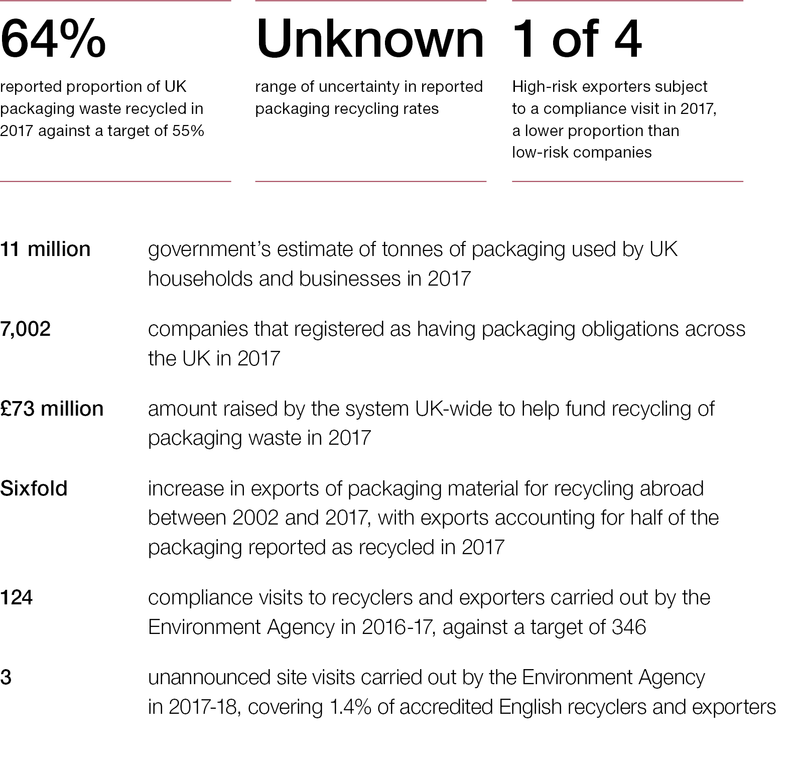 In 2017, 7,002 companies registered as having packaging obligations across the UK. 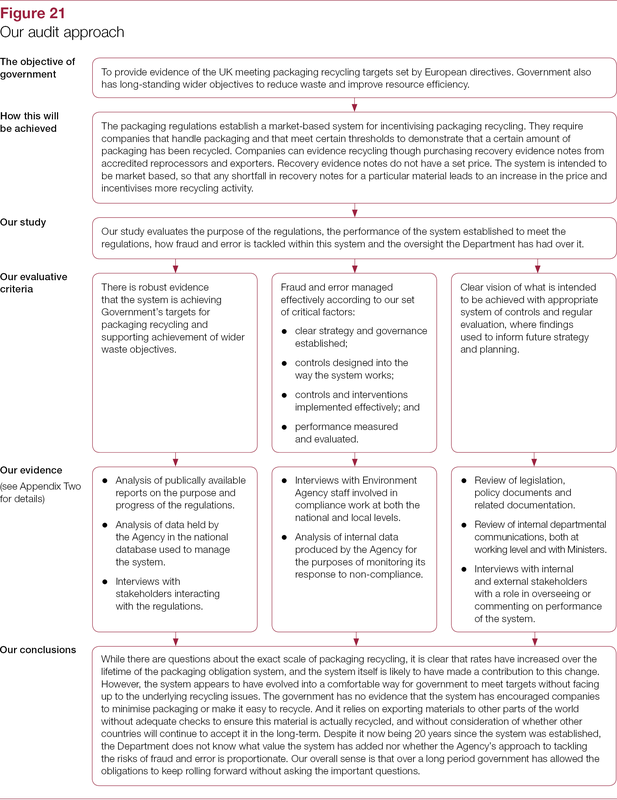 government’s wider oversight of the system (Part Three). 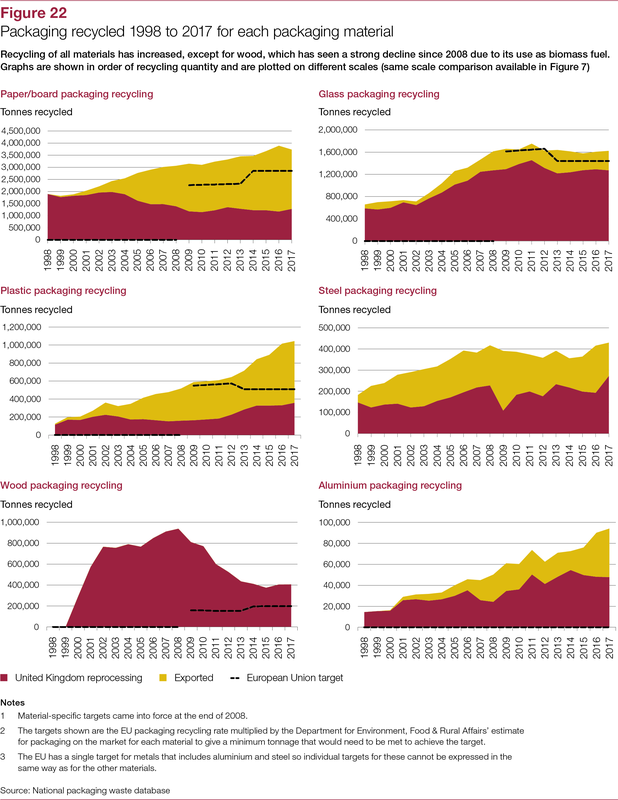 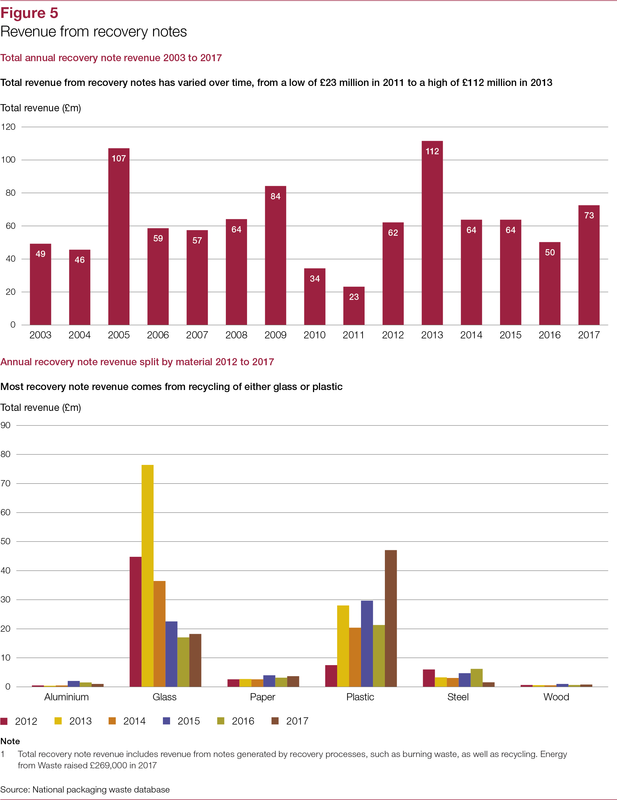 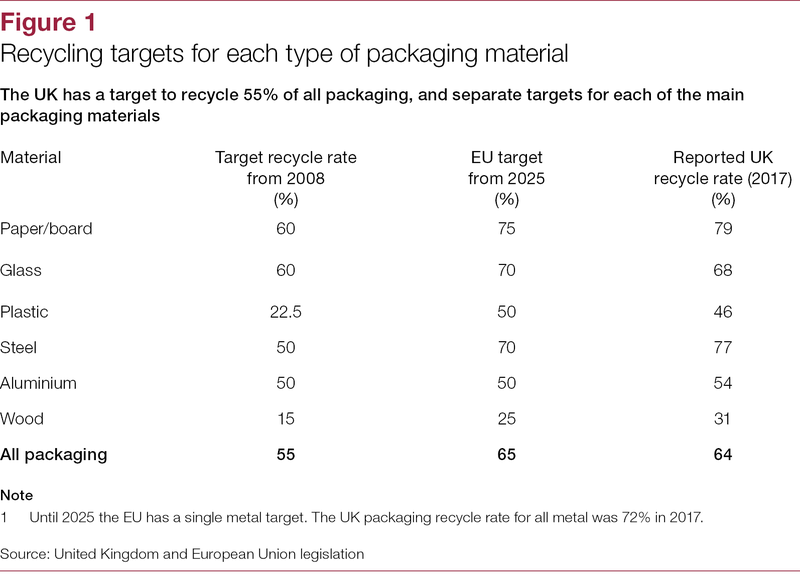 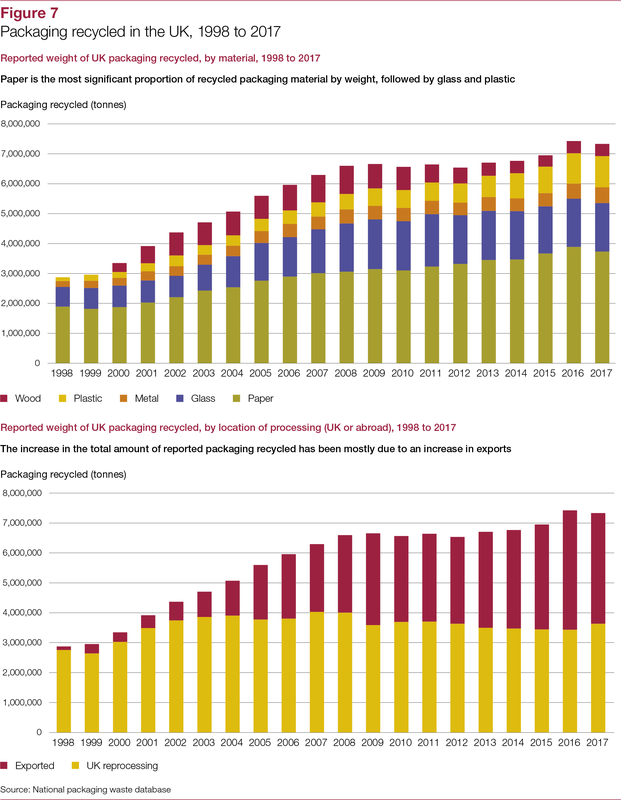 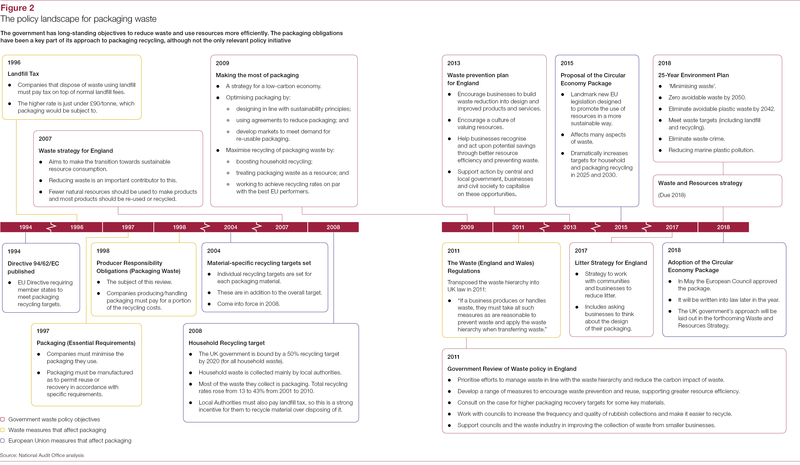 While there are questions about the exact scale of packaging recycling, it is clear that rates have increased over the lifetime of the packaging obligation system, and the system itself is likely to have made a contribution to this change. 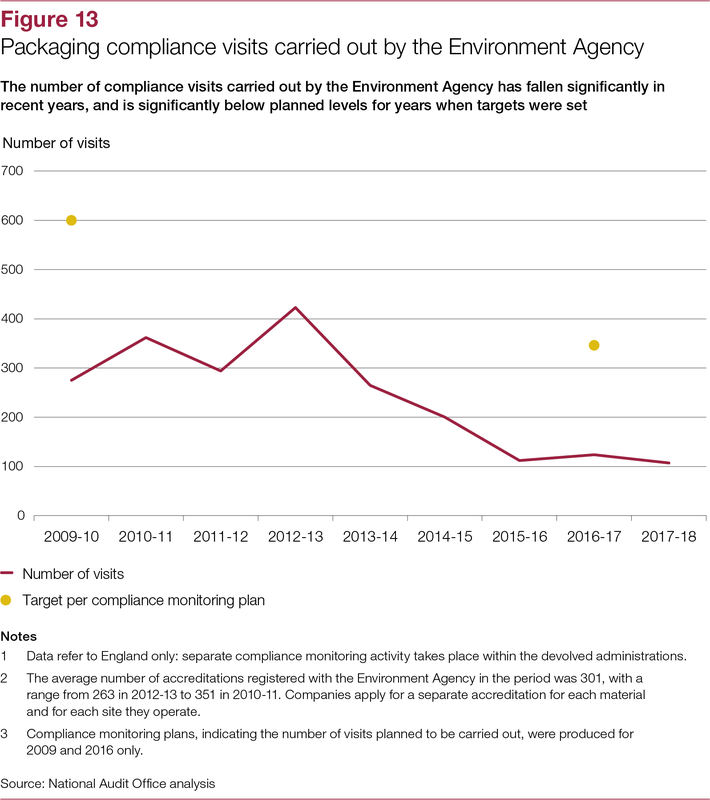 However, the system appears to have evolved into a comfortable way for government to meet targets without facing up to the underlying recycling issues. 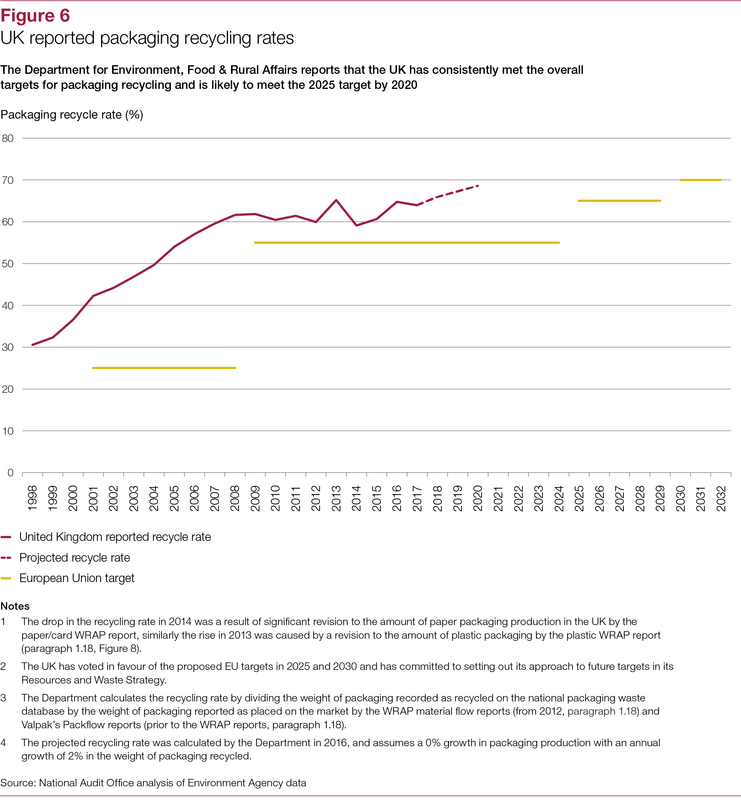 The government has no evidence that the system has encouraged companies to minimise packaging or make it easy to recycle. 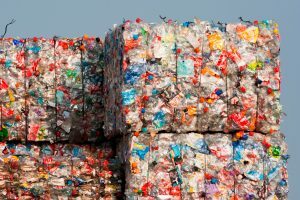 And it relies on exporting materials to other parts of the world without adequate checks to ensure this material is actually recycled, and without consideration of whether other countries will continue to accept it in the long-term. 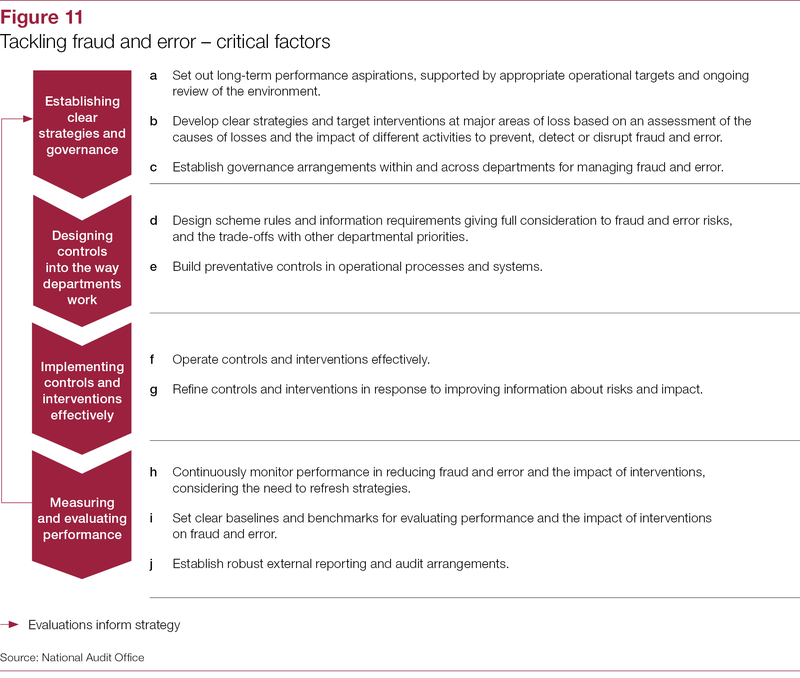 Despite it now being 20 years since the system was established, the Department does not know what value the system has added nor whether the Agency’s approach to tackling the risks of fraud and error is proportionate. 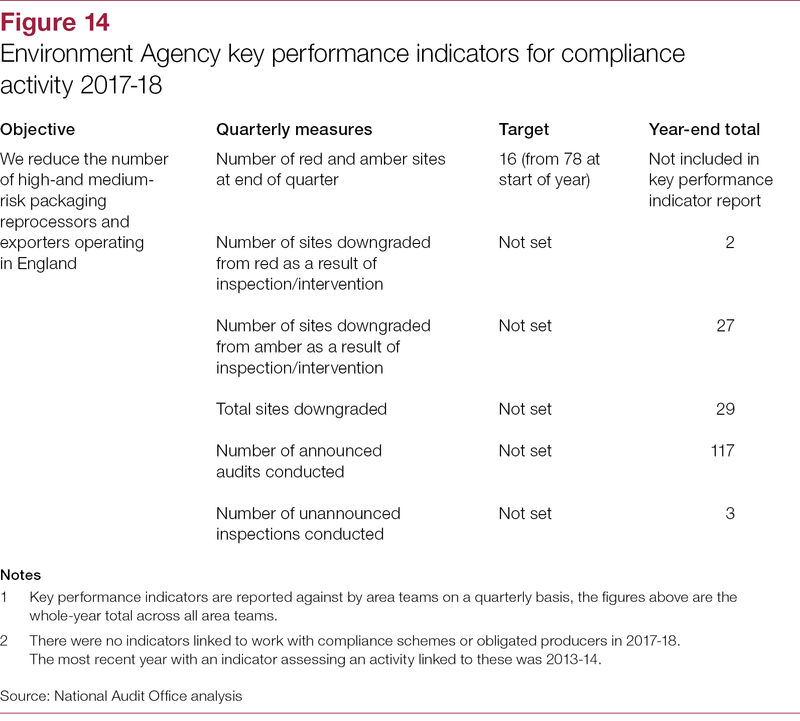 Our overall sense is that over a long period government has allowed the obligations to keep rolling forward without asking the important questions.